Some readers asked me online fabric shops in Japan. They are written in Japanese only, and don't ship internationally, so you might feel hard to see their sites. But for whom want to know how they are, I made this list. The first one is "Haru". I call my boyfriend "Haru", so I like this shop very much (* v *). 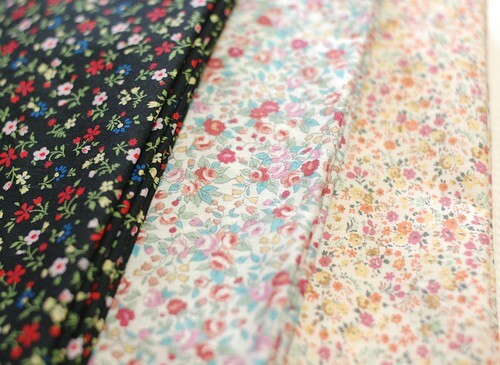 They sell lots of fabrics, and especially, their flower print fabrics are beautiful. This is a page of flower print cotton. The next shop is SWANY. They have two real shops, and one is only two stations away from my apartment. But I know their fabrics are good quality, so I get their items in relief from their online shop. Here are their outlet price fabrics. I like their linen fabrics. I got the white linen fabric for this bag in their sale. The third shop is CHECK&STRIPE. It's famous, isn't it? Their fabrics are beautiful but it's expensive for me. So I get their fabrics sometimes when they have discount price fabrics. I got fabrics from this shop, CRAFT PUKU too. Their fabrics are very cheap, and usually I'm content of them. 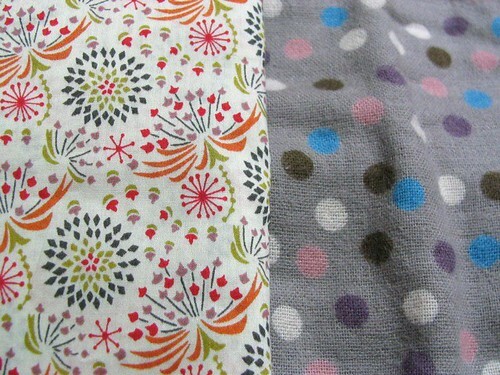 Now, I'm thinking to get these dot fabrics. For cotton linen, or cotton double gauze, I love this shop, "Fabric Store". But their fabrics are not so low cost, I wait their sale or their fabric bundles. And for lace, I use this shop, "Merci". But for example, this lace of 10 yard long costs 3 dollars or less. At the last, I got these fabrics from this shop, "FABRIC BIRD". Because of their sale, I got them in only 4 dollars per meter. But most of them went out of stock soon after they began the sale. Most of Japanese online shops have their mail magazines, and to know when they begin sale, we should read them. Oh, today I went to my nearest fabric shop, "Okadaya". Today they just began their sale, and I could get all items in 20% off price. So I got these fabrics. One is Liberty, and the other is cotton double gauze fabric. I'm happy with them (* v *)!!!! Have a good weekend! I usually stay with my boyfriend but he is away for three days. 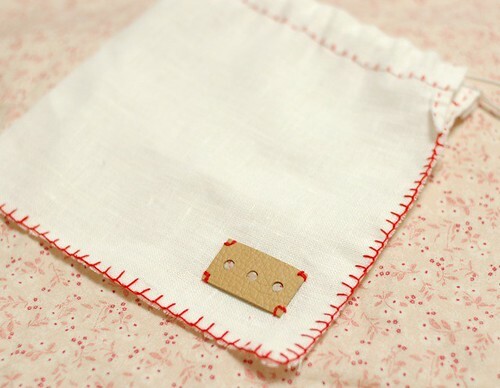 I make many items with these new fabrics! I've been following your blog for a while now.. The things you make are brilliant! The japanese cottons are gorgeous.. It's difficult to get such gorgeous fabrics in Malaysia.. Thanks for the adresses. It's a shame they don't ship intl :p These fabrics are so cute. I have found some on etsy.com There is a trick to read japanese websites -> google translate. It's not perfect but at least you get an idea. hi, I saw your blog and I love your work. I am grateful for you for all the so pretty tutoriales. Thank you for sharing some of your fabric sources! Thank you for sharing your fabric links/sources! The Liberty print in the last photo is my favorite! what a beautiful fabrics *_* I've seen similar fabrics in some shops here but I think the quality is lower maybe.Thanks for the pincushion tutorial! Hi. I just met you blog and I have to say I'm in love. I love your creations and love even more the fact that you share your tutorials. I'm gonna try and make an Sarubobo plush, I'll later let you know how it when. I added you to my flick contacts as well. The Japanese have all the good stuff. I want to go there and shop for fabrics and craft and sewing books. I've always admired fabrics done and sold in Japan! The textures and patterns seem to suit alot of taste and styles! I simply love Japanese fabric! So much variety. Pity they don't ship internationally though. i discovered your blog just some weeks ago. And I read all your posts and really enjoyed it. Your work is very inspiring, and the goods are sooo cute and lovley. Please have a look on my blog too, if you like. I haven´t posted very much yet, because mine is very new, but i`m working on it. You can take a look if you have free time. Everything is cute! 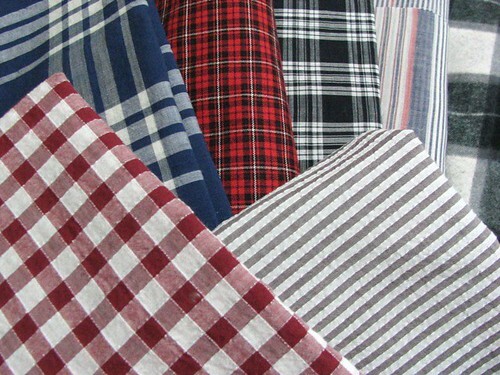 How much are the average price if fabric in japan? My aunt lives there but im too leary ask her a favor to buy me some fabrics. I do admire everything im japan! I do have a blog too! Mostly i blog about food and family. Pls. Drop by if have time. Thank you so much for this post. I've been searching from recommended fabrics in Japan, happy I finally found it. Hello! I just moved to Japan and I am looking to make some thermal curtains. I need a lot of batting to make the curtains, do yo know where I can buy inexpensive batting? I live in Mie near Nagoya, but I don't mind shopping online! Thank you! This post is a great resource and I might just have to buy some lovely cotton linen for the curtains! This is nice blog. Thanks for sharing it. I'm from Japan, I've been looking for online shop for fabrics. Finally... Domo Arigatou. It was mendokksai to go the store to buy esp. when carrying it by yourself. Hi Guys we Provide Beirut escorts who are accessible 24hrs in whether in your home or a Five Star Hotel. Simply visit our site on the off chance that you need to appreciate the sexual delight of Beirut escorts services in Lebanon. We can make your stay super unique and incredible in Beirut. We comprehend what to do to put a grin all over So don't squander your chance visit us now We are the best BeirutEscorts Agency which offers our demographic only best quality administration in addition to a stunning different Women in Beirut.